Have you noticed a lack of meat recipes so far in this blog? One of us is a vegetarian…and it is just simpler (and somewhat healthier, and somewhat more economical) for us to have meatless meals. But later today our resident vegetarian is going out of town, so this is an opportune time to try out some beef recipes. We stopped back by the grocery store (yet another repercussion of having missed the food delivery) and were delighted to find that they have expanded the beef line to stew beef and added a chicken supplier, Tanglewood Farms’, Naked Bird Chicken. It is most convenient that the local food movement has gained in popularity!!! I had a cart-jumper, an oven ready entree,”Chicken Fontina,” from Tanglewood’s My Personal Chef Line. While not in the spirit of cooking for scratch, it looked delicious… chicken breasts stuffed with fontina cheese, prosciutto, and sun dried tomatoes. Great for us omnivores, but not so popular with the vegetarian. So for her (and us too) I added homemade focaccia, mozzarella, basil, tomatoes and a salad to the meal. 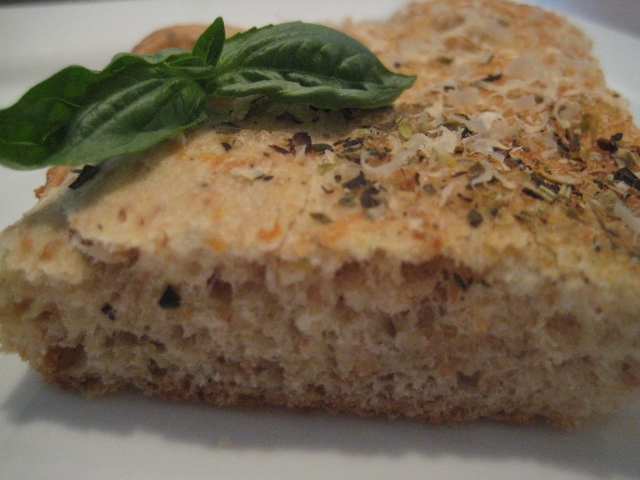 I make the focaccia fairly frequently and it is a simple, reliable dough-from-the-bread-machine recipe. I’ve never had any complaints (except the time I made it with 100% whole wheat flour). 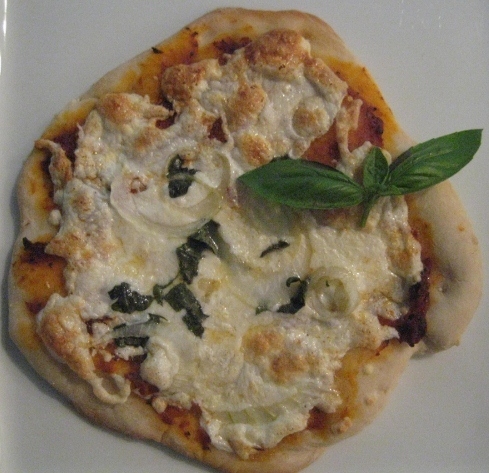 This recipe is adapted from the Breadman instruction book. Select the dough cycle and wait. Press the dough into a greased pan.